I moved to Queensland from the UK and learning to deal with the extremely fierce weather here has been a big learning curve. Skin cancer rates are high and it is something everyone needs to take seriously (check out this post on the Cancer Council website for stats). I receive so many emails and Facebook messages from readers who share my concerns over sun safety for kids, in particular. Nobody wants to move their kids to a new home that could potentially damage their health. 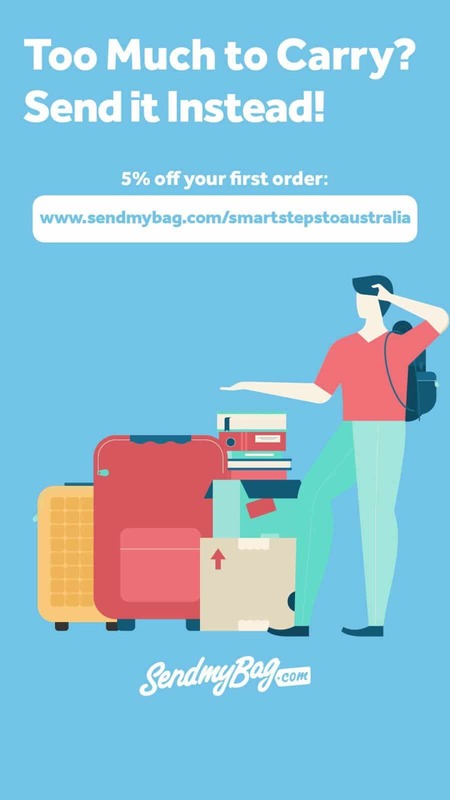 The sun isn’t a reason not to move to Australia or to take a holiday in Australia though – you just need to be sun smart and think about the best sunscreen for your face and body, cover up when you can and make smart decisions about the best sun protection. 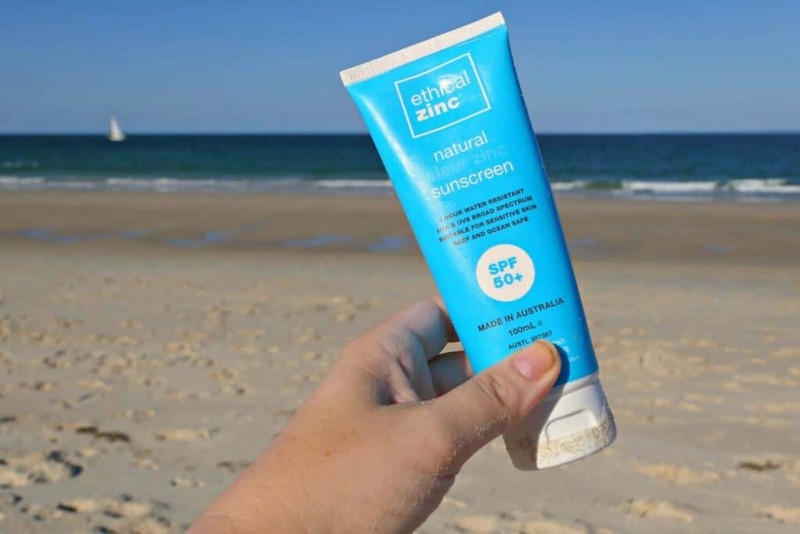 As part of this post, I’ve trialled and done research into a number of different Australian sunscreen brands of zinc creams. I’m not a scientist – I’m just a mum trying to choose the best sunscreen for my family. I was kindly sent samples of sunscreen to try from some of the brands. All opinions are my own. Some of the links that appear in the post are affiliate links which means I receive a commission if you go on to purchase through the link at no extra cost to you. Why are skin cancer rates in Australia so high? Does SPF matter when it comes to sunscreen? Best zinc sunscreen: Which really is the best natural sunscreen Australia has to offer? 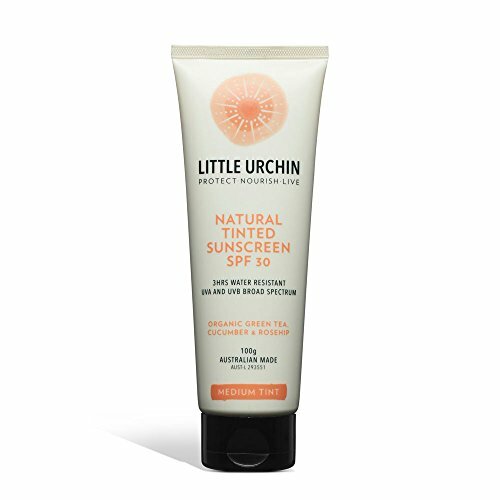 Little Urchin has two natural sunscreen products: Little Urchin Natural Sunscreen SPF 30 and Little Urchin Natural Tinted Sunscreen SPF 30 (they also have a Little Urchin Natural Daily Moisturiser which doesn’t offer an SPF, so be sure to choose the right product). The Little Urchin sunscreen products are Australian made and Australian owned. 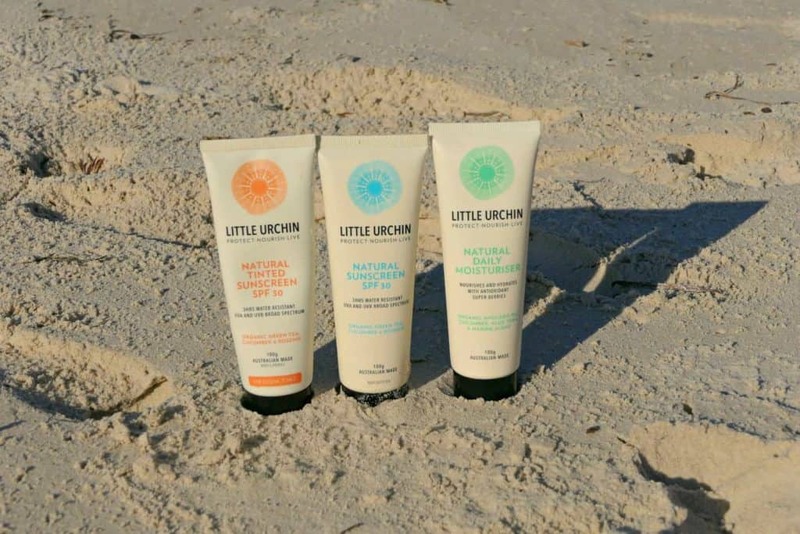 The Little Urchin sunscreen brand was started in Australia by founder, Chris Matthews. Chris saw his daughter being smothered in sunscreen at daycare and was worried about the chemical sunscreen ingredients being put on her skin every day. This is something I’m sure many of us can relate to. What followed was a journey to develop an alternative natural sunscreen using essential oils and natural ingredients which he then went on to have professionally developed. I don’t mind admitting that I’m in love with the Little Urchin sunscreen branding. I think the logo is really cute and I like that the brand is named after sea urchins who are also sensitive to light and chemicals so created their own natural way to protect their young from the suns harsh rays. 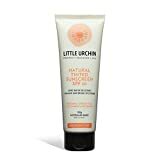 Little Urchin’s aim is to protect your skin from the sun with its natural formula without harming you or the environment. The products are toxin-free and are rich in nourishing oils, antioxidents and butters, along with green tea, cucumber and rosehip extract. While the inspiration came because the founder was trying to create the best natural sunscreen for babies and children with delicate skin, don’t be fooled into thinking these sunscreens are only for kids – they’re just as much for adults who don’t want chemicals on their skin. Both of the Little Urchin SPF products offer up to three hours of water-resistant UVA and UVB broad spectrum coverage making them one of the best sunscreens for kids (or grown ups) who love to play in the ocean. The sunscreen products are preservative free, and are reef safe sunscreens (zinc oxide doesn’t dissolve in seawater and the other ingredients are biodegradable and safe for the ecosystem). Their products aren’t tested on animals and contain only organic ingredients. You need to remember to shake the Little Urchin zinc suncream bottles before applying to mix the ingredients. The sun cream is quite thick but is very easy to apply – it feels weighty enough to feel like you are giving yourself good coverage but it isn’t greasy and goes straight into the skin (so doesn’t leave you looking white or greasy). My skin is dry and it drank it up easily and made my skin feel soft – it felt dry to the touch quickly after using. My kids loved that it disappeared easily as they aren’t keen on ones that take some time to dry and sink in – they just like to apply and run. The Little Urchin tinted sunscreen for your face gives a medium tint to leave you with a healthy glow. I’m not really a big wearer of make up but since moving to Australia I’ve made an effort to protect my skin so I’ve tried a few brands of tinted sunscreen before. I usually struggle to find a tinted sunscreen product that gives me enough coverage while feeling good on my skin (I find they either don’t give enough coverage or they feel too thick and heavy which I hate). 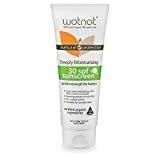 I can honestly say, of all the tinted sunscreens with SPF that I’ve tried, this is the best face sunscreen I’ve tried with a tint – it went on so smoothly, gave me a really even skintone and made my skin feel silky soft all day. I usually wear a mineral powder with an SPF over the top of my sunscreen, but this tinted sunscreen actually gives a nice, even coverage without needing anything else on top and it didn’t make me look shiny. It makes mornings really fast and easy. On sunny days, I can top it up easily with a bit more when I go out to do the school run in the afternoons. The Little Urchin products aren’t artificially fragranced. My kids took a while to get used to their smell as they were used to fragranced products but it didn’t take them long to get used to it. 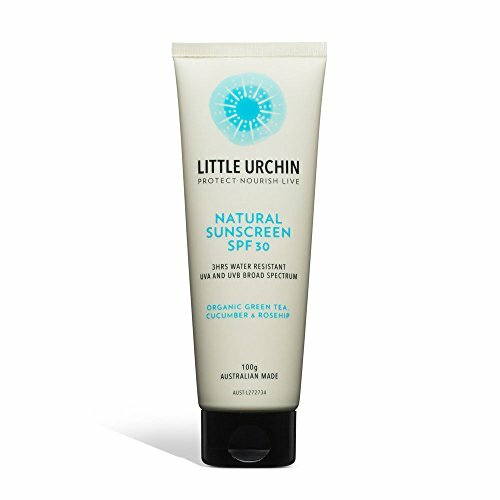 Little Urchin is a member of 1% for the Planet – a global network of businesses working together to create a healthy planet which is another reason why you should give their sunscreen products for your face and body a try. Simple As That focus on producing natural beauty products with organic, fair trade, vegan ingredients. 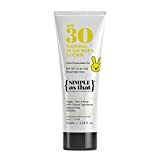 They offer two zinc sunscreen options: Simple As That 100% Natural Children’s Sunscreen SPF 30 and Simple As That 100% Natural Sunscreen Lotion. I really like their clean and simple branding – it’s smart and easy on the eye with very clear information. Simple As That’s lightweight mineral vegan sunscreens contain organic, natural ingredients. Offering UVA and UVB protection, the creams have zinc oxide as their core ingredients with other natural ingredients including green tea and raspberry seed oil. The difference between the two sunscreen options is that the main sunscreen includes raspberry oil and the children’s version includes chamomile oil instead which their site says is more suited for children’s delicate skin. Both Simple As That zinc sunscreens are reef safe sunscreens and, although they are gently fragranced, the smell is from a vegetable-based fragrance so the very slight smell is all natural. Both products rubbed in easily and dried quickly to the touch. My kids were very happy wearing these – they didn’t mind the smell, and liked how quickly the product disappeared so they could run off to play. The products didn’t say they were water resistant – they just say to reapply after being in the water or after exercising, so that’s something to bear in mind. We really liked the products though and my kids felt comfortable with it on their skin. Given they don’t say they are water resistant, I’d keep these for school mornings as it dries quickly so would be easy to apply in a rush. I am SO excited to have found this product and it will forever be in my beach bag from now on. 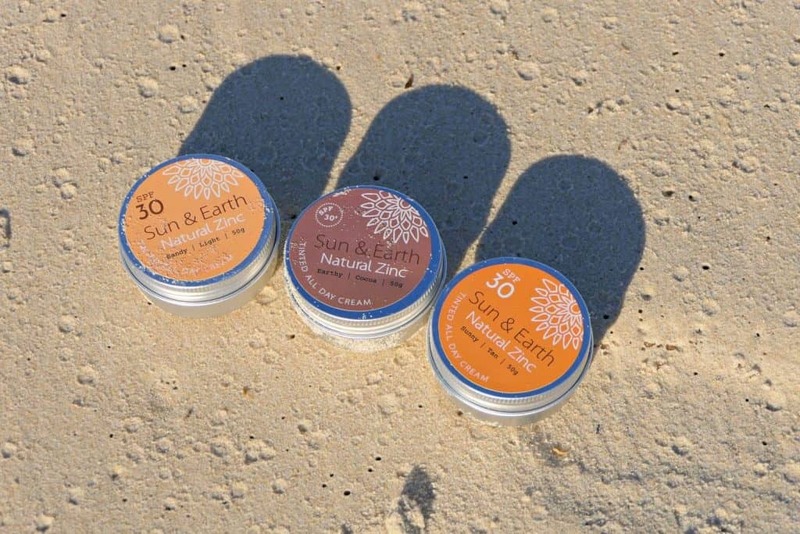 Sun and Earth Natural Zinc promise their sunscreen will ‘nourish, tint and protect’ your skin from the physical effects of the sun. Because the creams contain coconut, cacao and olive oils, you can be sure your skin will feel soft and moisturised. The zinc oxide protects with a physical barrier from UVA and UVB rays and they offer SPF 30. 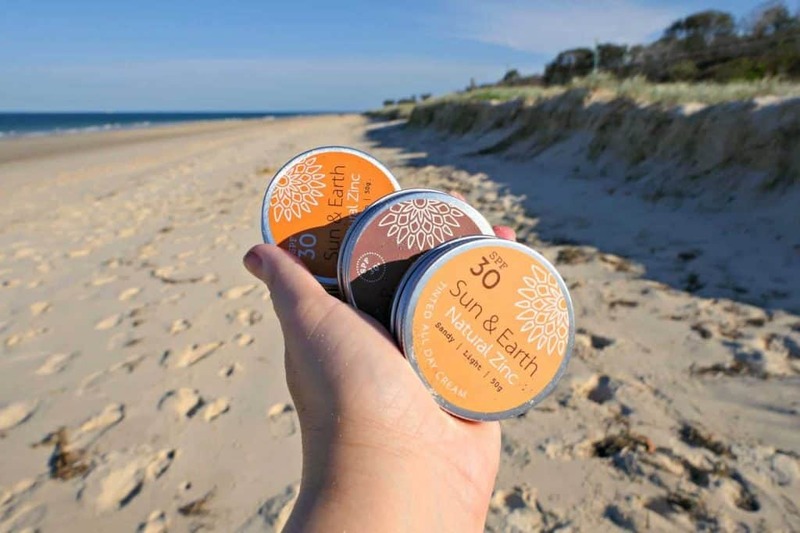 These pots of physical sunscreen are handmade in Byron Bay in New South Wales using 100% natural ingredients including locally sourced beeswax. The product is certified organic and is reef safe. I love that the company use solar power to make the suncream so being sustainable is at the heart of the company. All ingredients are biodegradable and non-toxic. It is also perfect for skin of all ages. The products come in three different shades – I’ve tried all three out on my family and I absolutely love them. I expected them to be quite strong colours and feel heavy but the colour was very gentle. They aren’t like a sun cream, more like a wax. My skin feels so soft and moistursed after applying and I love the natural smell (the kids say they smell of chocolate). They do feel sticky when you apply them but they aren’t as thick, heavy and gloopy as the zinc sticks we’ve tried – more smooth and sticky a bit like the texture of hair wax. For me, the Sandy Light colour is the perfect tone but the Earthy Cocoa gives me a nice bronze effect if I add it to my cheekbones, nose and chin. I wouldn’t wear these every day as an all over tinted face sunscreen but they are great for days at the beach when I know I’m going to be in the sun a lot. My kids are totally hooked on these little zinc pots and they loved being able to choose their own colour. If you look at the picture at the very top of the post, that is me applying the darkest colour of Sun and Earth Natural Zinc to my son’s face – he has a tanned face full of freckles and you can see from the picture that you can just see the areas I’ve applied it without it being too dramatic. Now, we spend a lot of time at the beach/parks/swimming pools and no matter how much sunscreen I apply to my kids, the sun always catches them under their eyes and I never seem to be able to keep up with reapplying fast enough as they go in and out of the ocean. This Sun and Earth zinc oxide sunscreen stayed put. It didn’t wash into their eyes in the water (which is often our problem with sunscreens) and didn’t wash off even after an afternoon sitting in water playing with sand. I am so impressed by the quality of it and the staying power. While it doesn’t state on it that it is water resistant, I have seen that it definitely is. The products do stay a little sticky as they stay on the surface of your skin rather than sinking in. You can apply a little less if you wanted to wear it as a tinted day cream but I think it really excels as a thick sun protection for beach days. For me, I will use this product in conjunction with another sunscreen on beach days – this is best for around the eyes, cheeks, chin and nose. Above is a picture of my daughter wearing a strip of the medium colour across her nose and cheeks looking very happy with herself. Ethical Zinc Clear Zinc Sunscreen is made and tested in Australia and was created by three founders with a passion for safe sun protection. Ethical Zinc Clear Sunscreen provides SPF 50 with broad spectrum UVA and UVB coverage. It includes pharmaceutical grade zinc oxide as the only active ingredient. It offers 4 hours of water resistance and is reef and ocean safe, plus it is suitable for sensitive skin. It only contains natural ingredients, it’s paraben free, PABA free and it isn’t tested on animals. Utilising 20 years of research and development, they have created a natural clear zinc that can be worn on the face or body daily. The cream is very thick and has a very mild coconut/vanilla scent (from the coconut oil ingredient). I have dry skin so it rubbed in but it was a little bit greasy and took a while to fully sink. Personally, I like this as it makes my skin feel like it is being nourished (I really dislike thin sunscreens as I also want to feel like I’m being moisturised while also feeling like my skin is getting the protection it needs). I would apply this (as I would any sunscreen) a while before I was heading out into the sun so that it has chance to fully sink in. My kids thought this sunscreen smelled the best out of all the ones we tried and they loved the brightly coloured bottle (that also made it easy to find in the bottom of our beach bag too!). It took a bit of time to get the amount just right – one of my boys squirted a huge blob onto his face this morning before school and it took some rubbing to stop his face being too white (but that was his fault as he put too much on without realising it was thicker than the sun lotions he was used to!) 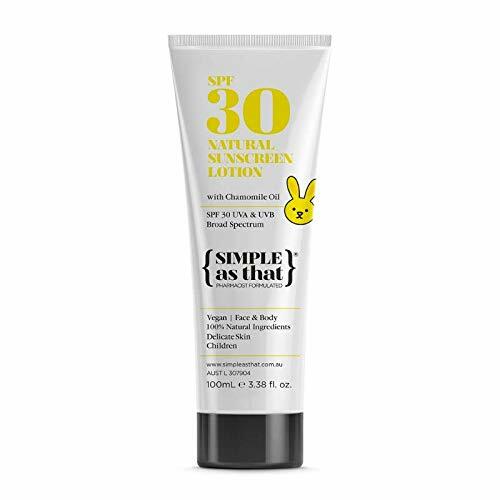 I’ll be saving this product for beach days and pool days (or giving it to my husband who works outside all day) as it is water resistant for up to four hours and as it goes on thick I feel confident it will give lasting protection. They also offer Invisible Zinc SPF50+ 4 Hours Water Resistant Sunscreen, 50mL and Invisible Zinc SPF50+ Junior Cream Clip-On Sunscreen, 60g. Invisible Zinc has developed a light and easy formula that rubs into your skin, without feeling chalky or turning you white or being too sticky. It provides a barrier for UVA and UVB rays. Compared with some of the other brands I tried, Invisible Zinc feels a little more lightweight and was very easy to apply – it’s a non-greasy sunscreen and it didn’t turn our skin white. 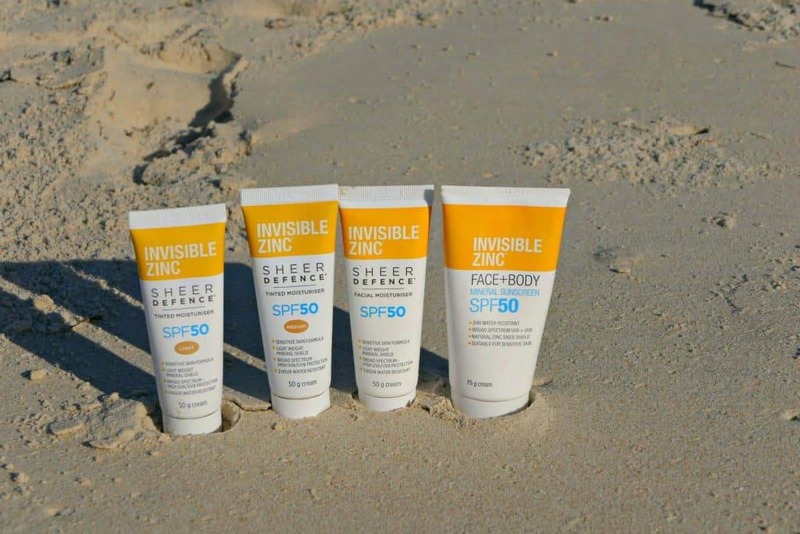 All of the Invisible Zinc products I tried said they were water resistant for up to two hours (and the Invisible Zinc Sport Mineral Sunscreen SPF 50 offers four hours water and sweat resistance so this is your best choice if you’re going to swim or be active). The Invisible Zinc Sheer Defence Tinted Moisturiser SPF 50 was a lovely product to wear and apply – it went on so easily and made my skin feel really soft. It didn’t give me the sort of coverage you’d get from a foundation so I wore it with some mineral powder over the top to make my skin look a bit more flawless, but I really liked how easy and fast it was to apply and how it made my skin feel. It accepted the mineral powder on the top without going flaky or patchy too. This will be a regular in my make up bag during summer as it felt so light on my skin. We all really liked the Invisible Zinc Face and Body Sunscreen product too as it was easy to apply, dried quickly without feeling greasy and made our skin feel like it was being protected. I’d be happy wearing it on beach days or as an every day sunscreen as it was fast and easy to apply. UV Natural offers a range of natural sunscreens that were created by founder, Shirley Livesay. Shirley had a dream to create a natural sunscreen product in Australia and worked for years to make it a reality, even after being challenged by chemical companies through the courts. It’s a really inspiring story – the products are the result of one woman’s passion! I’m so glad she fought to get these to market because we love these products. The UV Natural sunscreens contain zinc oxide combined with natural oils and botanicals including green tea extract, grape seed and lavender. The zinc sunscreens are SPF 30 and offer UVA and UVB protection. The products are cruelty-free, lightly fragranced and water resistant (the main sunscreen is water resistant for up to three hours and the baby version of the zinc sunscreen for up to two hours), reef safe and vegan. I think UV Natural offers the best baby sunscreen out of the options we tried. My advice is to apply a little of the sunscreen at a time and rub it evenly into your skin. The cream goes on quite thick and is a little sticky while it settles but it doesn’t turn you white. It felt really nourishing on my dry skin, and has a gentle scent that my kids really liked. 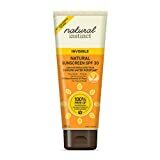 I used the UV Natural Baby sunscreen on my son who has the most sensitive skin and he really liked the way it felt and asked if he could wear it again when it was time to reapply. I love that the baby sunscreen comes in a small handbag sized bottle too – that will be handy to carry around. Even though I wasn’t reviewing natural aftersun options as part of this post, UV Natural also kindly sent me a bottle of UV Natural Chill skin cooler to try out and I need to tell you about it! 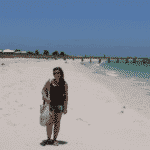 During our day at the beach to test the sunscreens, I started suffering with dermatitis under my wedding, engagement and eternity rings which is something I get from time to time when it is hot. I didn’t want to take my rings off at the beach and risk losing them so I kept them on until we got home. When I finally took them off, my skin was so red and sore underneath – it was much worse than any other episode I’ve had of it. I had the bottle of UV Natural Chill to hand, so applied it straight away. It didn’t sting or feel cool or anything really so I wasn’t expecting much improvement as my finger was looking pretty sore. Anyway, the next morning I woke up and found my finger wasn’t red anymore – it was my usual skin colour again and my skin was healing already. I applied it again a couple more times that day and within two days I had my wedding ring back on as if nothing had happened. From past experience, I tend to be without my rings for a week or two when I get a flare up – sometimes longer. I actually couldn’t believe how after two days you couldn’t tell I’d even had a problem. Now, I’m using this product to treat everything from dry skin to mossie bites! It is amazing. I didn’t have time to try all of Australia’s best sunscreen products – there are many more available. I’ll give you a quick run down of a few other Australian sunscreen brands that have zinc oxide and other natural ingredients that you might also want to check out. 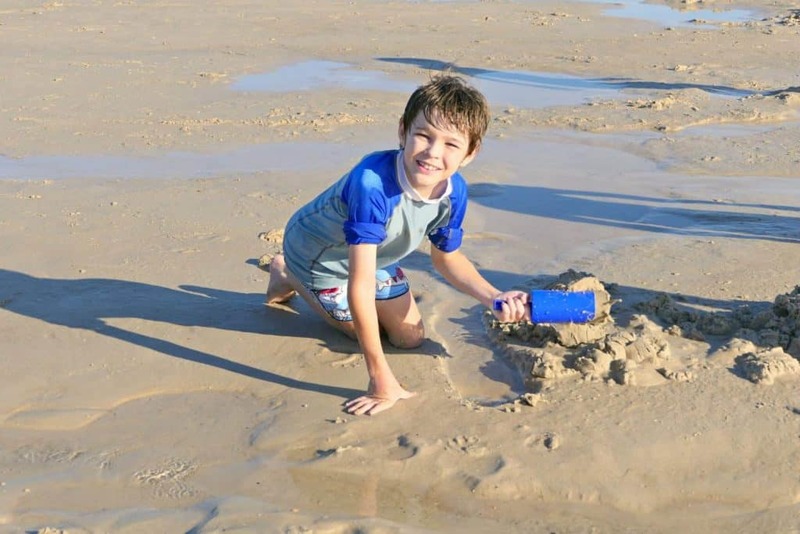 Wotnot has created a reef friendly, skin-friendly natural sunscreen suitable for the whole family. 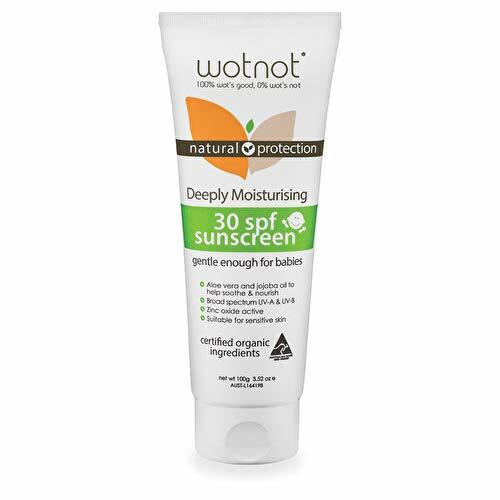 With UVA and UVB protection, the Wotnot Natural Sunscreen 30+SPF 100g zinc oxide product offers SPF 30. Suiable for sensitive skin types, the all natural sunscreens has a high level of natural oil making it moisturising and softening. The organic ingredients are GMO-free and free of parabens, fragrances and chemicals. The inclusion of aloe vera and jojoba oil soothe and nourish your skin. Please note that the two main sunscreen products do not list that they are water resistant. Only the facial sunscreen and primer which says it offers two hours of water resistance. 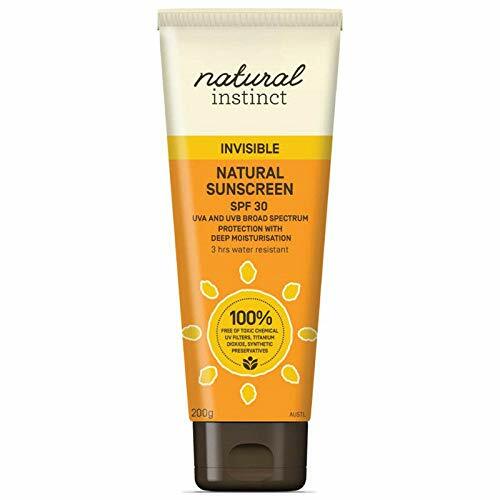 Natural Instinct offers three different types of mineral sunscreen with zinc oxide: Invisible Natural Sunscreen SPF 30, Kids Natural Sunscreen SPF 30 and Tinted Face Natural Sunscreen SPF 30. All of their products include zinc oxide and prevent UVA and UVB rays, and they are reef safe sunscreens. They offer 3 hours water resistance. The products are deeply moisturising and include skin conditioning ingredients including jojoba oil, shea butter and vitamin E.
The kids’ version leaves a translucent white protective layer on the skin which allows you to see where the sunscreen has been applied which is a clever little trick. The tinted sunscreen can be used under makeup. It offers a medium coverage and it has a matte finish that isn’t thick or heavy. Surf Mud is a natural zinc oxide cream that was formulated by surfers. It contains only natural ingredients, is palm oil free plus it has no preservatives, is reef safe and is cruelty-free. You can get it in a little pot or in a tube as a sun lotion. 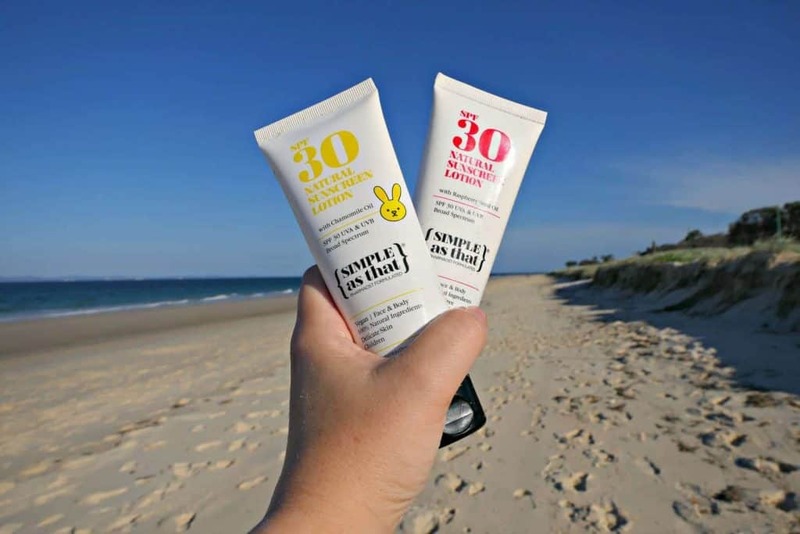 Their Surf Mud The Lotion SPF 30 Sunscreen is 4 hours water resistant and their Surf Baby Natural Zinc SPF 30 Sunscreen also offers 4 hours water resistance. Both offer a good choice of sun protection for families. Mukti Organics offer a daily moisturiser SPF 15 with zinc oxide green tea and rosehip. It offers protection from UVA and UVB rays. It’s made in Australia and certified organic, vegan, cruelty-free and is suited to all skin types. They also offer a tinted moisturiser version, again in an SPF 15 if you feel that level of sun protection is high enough for your needs. The Australian natural beauty brand, Skin Juice, offer a Skin Juice Tinted Moisturiser in an SPF 15 and a Skin Juice Untinted Moisturiser SPF 15. Using superfood ingredients, the SPF 15 protects against UVA and UVB rays. I love the vibrant packaging. Again, SPF 15 is as high as they go though. Thanks for making it this far into the post. 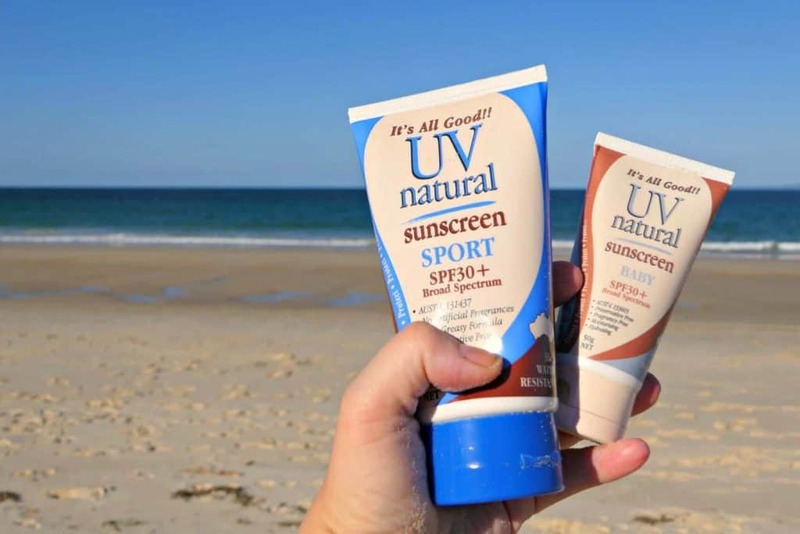 Now you’ve read my zinc sunscreen reviews, it’s time to learn a bit more about choosing the right sunscreen and why I chose to only review the best zinc sunscreens in Australia instead of including titanium dioxide sunscreens and chemical sunscreens. While we all know we need to wear sunblock, there are a few issues you need to think about before deciding which is the right sunscreen brand for you. You apply sunscreen to your face and body often in Australia, so you need to think about the sunscreen ingredients to make sure you’re happy putting them on your skin. When you swim while wearing chemical sunscreen, the chemicals can wash off and be absorbed by corals which can ultimately result in bleaching. National Geographic says that even if you don’t swim while wearing it, it can still go down the drains when you shower and eventually make its way into the ocean. 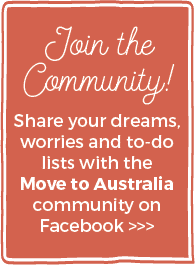 A big reason for us moving to Australia was because we love the environment here – the beaches, the marine opportunities, the wildlife. We definitely don’t want to be involved in causing damage. Some sunscreens stay on better when you swim and sweat than others. For watersports and outdoor activities, make sure you choose an appropriate sunscreen. (Be sure to always reapply your sunscreen after being in the water or doing sports too). The best sunscreen for face may not be the best sunscreen for body, too – it’s OK to have different sunscreen products for different needs and also for different times of the year. 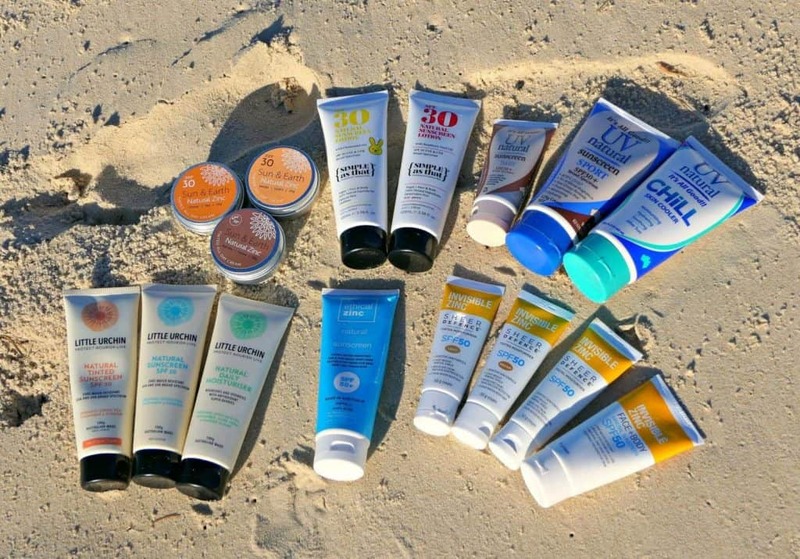 Over the four and a half years that we’ve lived in Queensland, I’ve tried many different brands of sunscreen and learnt a lot about what makes the best sunscreen for your body, what is the best face sunscreen and also what reef safe sunscreen options are available. I’ve used some sunscreen brands that felt great on my skin but after doing research recently I’ve realised the sunscreen ingredients weren’t something I wanted to put on my (and my children’s) skin let alone have washed into the ocean to damage the reefs. After receiving yet another email from a concerned reader, I decided to do some in-depth research into the best sunscreen in Australia because we all want to make sure we’re using the best natural sunscreen protection. Australia is a unique environment and because of the intense sun here there are some incredible Australian sunscreen brands creating organic sunscreen products that are gentle enough to use as a baby sunscreen or as sunscreen for sensitive skin. Whether you want to find a vegan sunscreen, a reef safe sunscreen or a baby organic sunscreen – the thing we can all agree on is that the best sunscreen protects our skin from harmful rays without causing any damage to us or the environment. The ozone layer – an outer layer in the Earth’s stratosphere – is there to absorb UV radiation. As it is depleting, the protection it gives reduces, meaning more of the sun’s harmful rays reach us. Australia is located closer to the ozone hole that has developed over the Antarctic and, during summer, Australia is closer to the sun which means we receive more of the potentially damaging rays if we don’t take precautions. Another reason for high skin cancer rates is that migration to Australia is high – over generations, skin type adapts to suit the environment but as many of us have moved from countries that don’t see as much sunshine, our skin just isn’t used to it and we haven’t got any natural sun protection in the pigment of our skin. 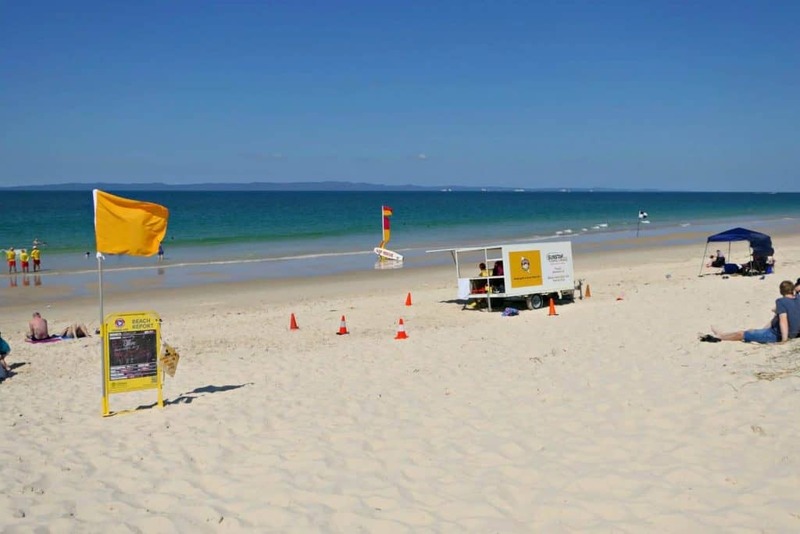 The lifestyle in Australia involves going to the beach, playing sport and being outside. 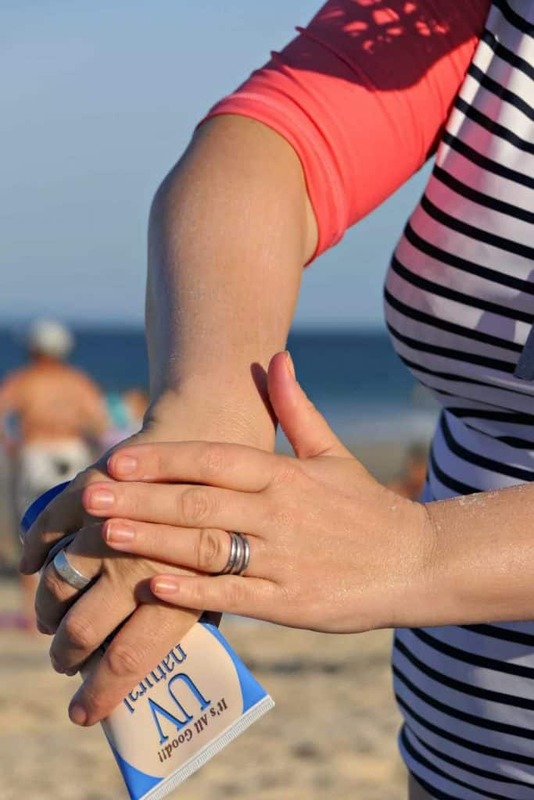 We don’t need to stop doing those things but we do need to make sure we’re aware of our sunscreen options and figure out the best sunscreen protection to keep us safe. If your unprotected skin would burn in 10 minutes, then the SPF should theoretically give you 15, 30, 50 times more protection. However, SPF 50 only offers marginally more protection than an SPF 30 sunscreen. What matters the most is that you apply it often and you apply it liberally to make sure you’re getting enough sunscreen coverage. Personally, I always choose a SPF 30 or above. When I first moved to Australia, I used to buy the big pump action sunscreen bottles with an SPF 50 cheaply from the supermarket. I assumed the SPF was all that mattered and that an SPF 50 meant I was making the right choice. I’d use this as sun cream for my face and as a body sunscreen. Over time, I found that my face was showing signs of sun damage and was developing slightly discoloured pigment patches. When I spoke to a skincare professional, she told me that chemical sunscreens can cause this pigmentation because the chemical sunscreen reacts to the heat. This was my first step towards learning more about my sunscreen options and it made me realise I had a lot more to learn about how to keep my skin safe in the sun. There are two types of sunscreen: you can get a mineral sunscreen (also know as a physical sunscreen) or chemical sunscreen. Chemical sunscreens are absorbed into your skin and then they absorb the UV rays before they can penetrate the dermis and cause damage. Some ingredients in these are known to damage coral reefs. Physical sunblock or mineral sunscreen sits on top of the skin and reflects the sun’s rays. Titanium dioxide and zinc oxide are the two main mineral sunscreen ingredients. The important thing here is that they stay on the surface of your skin, so don’t absorb into your body. Whether you choose to use a mixture of chemical sunscreens and physical sunscreens, it’s totally your choice and there is no one rule to this. Google it and make an informed judgement. I’ve decided after doing my research to focus my attention specifically on zinc oxide sunscreen for this post because I’ve decided that this is the right option for my family. We still use a combination of staying out of the sun and staying covered as our main approach to the sun when possible (my kids aren’t allowed on the beach or in the pool without their rashies on), but obviously, that isn’t always an option so in those cases I’m happy that from now on zinc sunscreen is our chosen method of sun protection. There are a number of questions you need to consider before deciding on the best sunscreen in Australia with a broad spectrum of UVA and UVB coverage. Will you be using your zinc cream at the pool or beach or while playing sports? Make sure you’re using a waterproof sunscreen (you will still need to reapply it often). Do you need a sensitive zinc sunscreen? Do you mind a heavy a zinc sunscreen that cakes on top of your skin and feels sticky or do you want something that is combined with other natural ingredients to sink into your skin and leave you feeling dry? Are you looking for a noncomedogenic sunscreen so it won’t clog your pores? Do you mind how easy your zinc sunscreen is to rub in your sunscreen? Or how greasy your zinc oxide cream feels? Are you looking for a tinted sunscreen for your face? If so, will you be wearing your tinted sunscreen on its own or adding a mineral powder with SPF to it to reduce shine and for added protection (if so, you’ll want something that won’t ball up or go patchy as you apply it – trust me a few brands I’ve used before just wouldn’t take a mineral powder on top!) Will the tint of the tinted sun cream give you enough coverage? Are you particularly looking for a face sunscreen for sensitive skin? Do you want a fragrance free sunscreen? Does it matter to you if its an organic vegan sunscreen or are you just happy choosing the best natural sunscreen even if it’s not vegan? 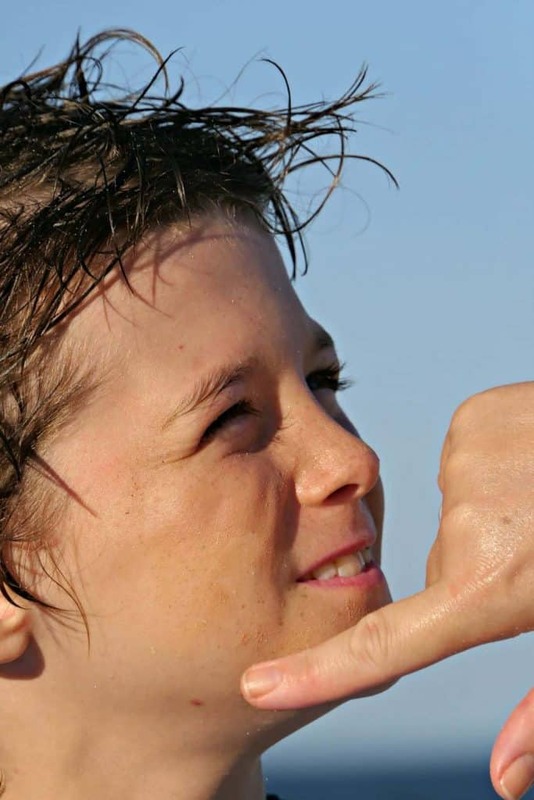 Are you looking for a sunscreen that is deemed reef safe in Australia? Do you want a physical sunscreen brand that gives something back to the environment? Many Australian sunscreen brands are involved in environmental charities and donate a percentage of profits or sales. It’s so important to say this: I think sunscreen in Australia is essential for everybody as you only get one skin. I know many people who choose not to wear anything because they are concerned about applying potentially harmful ingredients to their skin. Do your research to find a natural sunscreen product that you’re happy with. The sun causes damage to your skin, and you can’t stay out of it all the time. It’s also important to begin a good sun protection routine with your kids from the start – they need to grow up with this being part of their life so it becomes a habit for them. I really enjoyed trying out so many of the best natural sunscreens in Australia. I can’t single out one particular favourite as they all had different things that I liked about them and I will use them all in different circumstances. I would say the best face sunscreen with a tint out of those that I tried was both the Little Urchins tinted zinc sunscreen and the Invisible Zinc tinted sunscreen. I will continue to use both of these depending on how much colour coverage I’m looking for on the day. 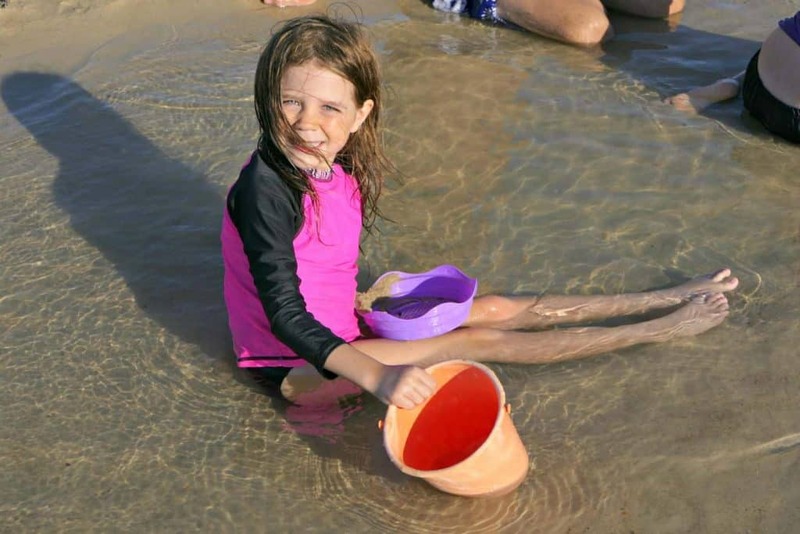 The best natural sunscreen for school days or going to the park – regular days when we just want to apply something quickly and go – my choices would be Little Urchin, Simple as That and Invisible Zinc. The best zinc sunscreen for beach days or pool days for me was Sun and Earth combined with Ethical Zinc, Invisible Zinc, UV Natural or Little Urchin. 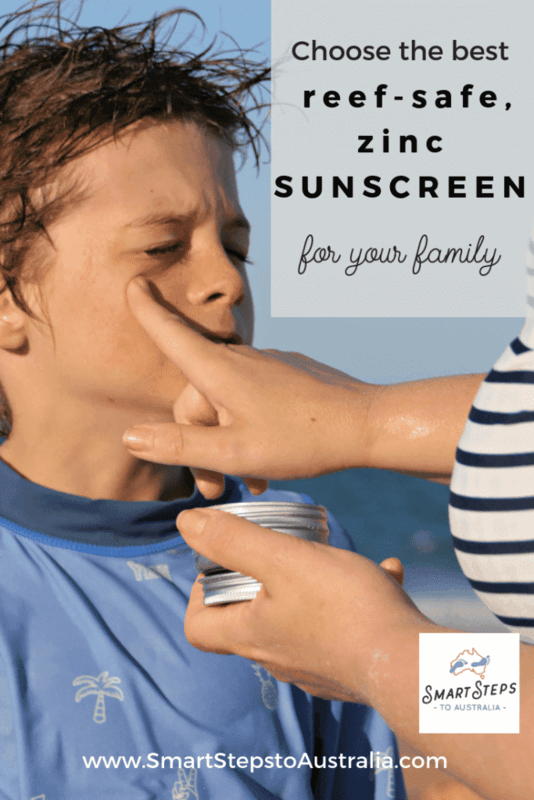 I’m excited that I’ve discovered so many clear zinc sunscreen options that offer sunscreen for sensitive skin, offer natural sunscreen AND are reef safe sunscreens which is something that is really important to us as a family. I really hope this guide to choosing the best zinc sunscreen Australia has to offer has been helpful for you. If you enjoyed it, please give it a share! Wearing sunscreen is so important and we can make a real difference to our health and to the environment when we choose the right brands of sunscreen.